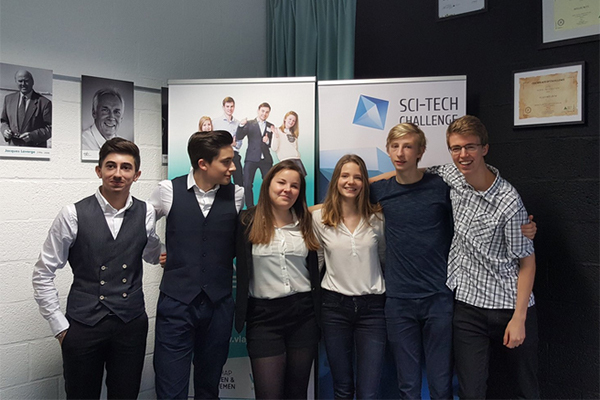 Congratulations to students from Italy who have been selected as one of the three best teams. EDOARDO: Our solution consists in changing car tires and introducing a new production of bioethanol, considering the long term evolution of technologies and the impact on the community. Our idea also presents economic advantages. MARTA, LUCA & DAVIDE: Our project mainly focuses on the development of an environmentally friendly fuel for cars that can be used on existing technologies to reduce by 40% the CO2 emissions from cars by 2040. Car-ethanol plans to produce bio-ethanol through the anaerobic fermentation of cellulosic waste material, such as paper and wood, thanks to an enzyme derived from the yeast Saccharomyces cerevisiae. To promote the recycling of these materials, our start up plans to stimulate citizens through awareness campaigns on social media. In addition, we advise the use of energy-efficient tires that reduce energy wasted in friction while maintaining the same adherence of the car to the ground. LAURA: Our idea is to use waste to produce bioethanol that can be used in current cars' technologies: this can happen thanks to an enzyme derived from Saccharomyces cerevisiae. We also propose the use of a new type of tires that reduces the energy consumed and together the CO2 emissions too. “I am convinced that the STEM field will be the most relevant for my generation”. EDOARDO: I really would like to work in a STEM field later. I’m almost sure that I will study engineering or mathematics at university. MARTA: Maths, physics and science are my favourite subjects at school. Teaching one of these subjects or becoming an engineer are my leading ideas for my future: surely I want to work in the STEM field. DAVIDE: Yes, of course. I am really interested in these subjects as they could give me a lot of possibilities for my future. Chemistry in particular is one of my passions. LUCA: Surely. It’s something that interests me and that I think offers a big variety of opportunities for my future. LAURA: I would love to! I would like to work with mathematics and its possible application in the field of economics, but I am convinced that the STEM field will be the most relevant for my generation. EDOARDO: I learned a lot from the Sci-Tech experience. Particularly I learned to work efficiently in a group and I got lots of information about energy consumption. MARTA: I think I learnt a lot about the importance of teamwork. I actually realised that alone I wouldn't have been able to come up and elaborate a successful solution to the challenge requested: making the most of all of the members' different strong points was essential. DAVIDE: Sci-Tech was an amazing experience. I learned how to work in a group listening to other people's ideas and how to search for specific topics on the Internet to find a simple and sustainable solution for the challenge. But most of all I learnt that you must never give up and lose all hope. LUCA: The main thing I will take home from this experience is how to work together. This experience also taught to me how to think fast but not in a superficial way, and also to compare my opinion with the one of others. LAURA: There are many things I have learnt from this experience: from analysing a challenging problem in order to find a realistic solution, to considering everything the problem involves, to work in a team, which, I have to admit, was not that tough. EDOARDO: Our challenge was to reduce by the 40% the CO2 emissions from cars by 2040. We overcame it by using bioethanol obtained from rubbish instead of traditional fuel. MARTA: I think one of the trickiest parts of the challenge was respecting the time limits: if we hadn't divided the work between us we would have never made it on time. DAVIDE: One of our main obstacles was finding a solution to the challenge that could be applied on the car technology existing nowadays: to overcome it we searched for a lot of information on the Internet. LUCA: The challenge was reducing the emissions of CO2 by 40%. We tried to think of a simple way that wouldn’t require changes in car engines and in people’s behaviour. Then we noticed that by 2040 the major number of cars will still be powered by petrol and diesel. So we thought of a solution that can replace this kind of fuel. The answer is BIOETHANOL. Bioethanol can be produced, thanks to a special enzyme from Saccharomyces cerevisiae, from celluloid waste. So we create jobs, we reduce CO2 emissions and we reduce waste.Then we found some special tires that reduce CO2 emissions by reducing the frictional force with the asphalt. The last thing is something that will help a lot: awareness campaign.This is mostly our project. LAURA: In my opinion the most challenging part of this experience was to find a solution and handle all its details in the short time they gave us. In order to do that we divided the work among the team member. We avoided many hours of sleep when we were in Rome as well! EDOARDO: We will work to improve our oral presentation and we will try to make it the most fluent and professional we can. We are excited about the finale because our project could be the best in Europe. It would be a great satisfaction. MARTA, LUCA& DAVIDE: Before flying to Brussels we will surely be working on our presentation, trying to improve the way we expose our project. 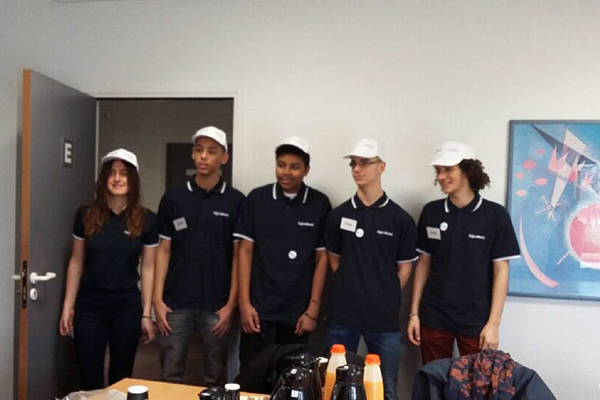 What excites me the most about going to Brussels is getting the chance to meet the members of the teams representing France and Belgium: I'm also sure their ideas are very interesting and detailed. LAURA: Surely my team and I will try to improve our ability in presenting our solution. I am so excited to go to Brussels and to meet the other two winning teams and all the people who will be there. “Personally I would recommend this experience to my friends who like scientific subjects because you can find out how it is to work on a technological project with your team and you can use your skills to find the best solution to an actual problem”. “I would surely recommend the Sci-Tech experience to others. Not only because you can increase your scientific knowledge, but also because you actually learn how to work in a team and how to present a project that must be realistic: these are skills we need to learn for life and that we can't always work on at school”. “I really recommend this experience because I think it's fantastic and I will always remember it; if I could I would do it again”. “I will recommend this experience mostly because I enjoyed it from the beginning to the end. Then because it helped me thinking about the job world and how I have to work in a group of people. In the end because it gave me the opportunity to know other people of different countries and to fly to Brussels”. “I will definitely recommend this experience to everyone as it has been an opportunity to meet new people, to apply in practice what we learn at school, to improve our knowledge and have fun at the same time”.